Tucked away on the South Oxfordshire boarder overlooking the banks of the River Thames is the 18 hole Caversham Heath Golf Club forming part of the 2,500 acre Mapledurham Estate. The championship length course was the first new golf course of the Millennium opening in 2000 and now boasting an impressive 550 members. Jon Scoones, Course Manager, has been at Caversham Heath since the build and has recently taken delivery of a fleet of new John Deere machinery to maintain the grounds. Heading up the line-up is the John Deere 8800 rough cut mower and 8700 fairway mower along with four 220E walking greens mowers, a 1200A bunker rake and a Tru-Turf greens iron to complete the set. 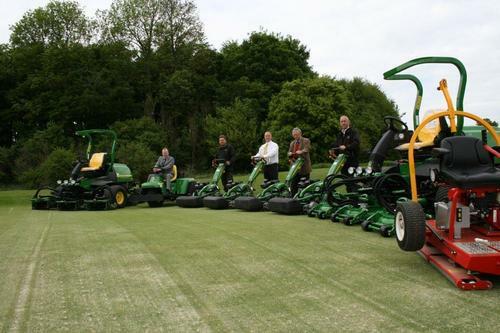 "With membership increasing we knew it was time to reinvest in some new machinery for the club" Say Jon. "There is so much kit on the market to choose from but I knew I wanted reliable machines with a good local dealer for service and support so John Deere and Farol Ltd were the obvious choice"
Martin Robinson, General Manager, knows the importance of the course being right for the players. "We always want to raise the standards of the course year on year, so investing in new machinery shows our commitment to the members. The course is planning to expand to 36 holes in the next few years so raising our game now will pay dividends in the future"
The course has used some John Deere kit since 2004, but now the course is firmly green. "The machinery we chose is tried and tested kit and owning some John Deere machines before we are familiar with the new models"
The 8700 PrecisonCut mower tackles the courses fairways with it's powerful diesel engine, QA7 cutting units mowing an impressive 290cm in one pass. Tackling the rough is the fast and reliable 8800 TerrainCut mower with it's exceptional cut quality following the ground contours. The four 220E walk behind greens mower have fully floating heads to follow the greens curves meaning a championship finish for the players at Caversham Heath. The bunkers have not been forgotten and a 1200A now tends to raking and levelling the sand with excellent coverage. The Tru-Turf roller is a relatively new machine to the market and ensures players will always have an exceptional flat green for that all important putt.